An interesting article from Eric Barker’s excellent blog – Barking Up the Wrong Tree – describes some of the work Dan Ariely is doing to work out the irrational behavior we demonstrate in the world of time management. While it might certainly feel as if we are victims of a larger plot, the fact is we need to own up to the monster we have created, albeit unwittingly. For example, many have written about the benefits of streamlining your smartphone to include only the apps you need. Or opening only one tab at a time when you browse. Or refusing to interrupt a task because a phone happens to ring in the middle of its execution. These tactics are all meant to preserve your attention and they all make logical sense. However, they remain difficult to implement on a consistent basis. For most people, they are far from becoming routine habits. Even when we understand this situation fully, we just don’t know how to make the transition from being available to every distraction to limiting ourselves to a single task at a time. Here are some of the things we have to do. In this matter, like many others, we underestimate our agency. We have set things up in our world to be as distracting as they are. This is good news – we can reset them to support, rather than hinder our progress towards our goals. This means carefully refining the “interruptional environment” around us – turning off (or on) beeps, buzzes, vibrations, flashing lights, pop-ups. Our first attempt won’t be successful and it may take several tries. For example, I just switched smartphones and now the old phone still has some strange beeps that I haven’t disabled because I can’t find what’s triggering them. It takes perseverance to set up the right combination for your needs. Ideally, there should be the capability to turn all of them off, as envisioned by the MyFocus button described on Nathan Zeldes’ blog. The MyFocus button has another purpose, which is why I’m such a fan of the idea behind it. It also serves as a virtual “closed door” to other people. When it’s switched from green to red, it’s a polite signal to other people that you are not to be disturbed. It’s like a closed door to someone’s office – only to be knocked on in emergencies. Training other people to respect a MyFocus button or even a closed door might take some skillful negotiations, especially if the person outranks you in the company. They may believe they have a permanent right to override whatever you are doing, in favor of the task they have at hand. In any case, it takes work. There’s a correlation between privacy and productivity, much to the chagrin of Office Managers throughout the world who are continually trying to cut costs. In the early 1990’s I attended training conducted by Tom DeMarco and Tim Lister. They established that the most productive programmers had more floor space than their counterparts. With more square footage (which was easy to measure) often came a door, walls and control over their visual and auditory environment. Plus, it meant that you were less likely to be interrupted by someone walking by who happened to remember the score to last night’s game and wanted someone to share it with. Now, the fact is, you can’t easily build your own office with the ideal mix of space and privacy. It’s the rare company that will even give you a choice. What you can do, however, is start a movement to boost productivity by shaping the physical environment. This will take nothing short of a campaign, and some savvy change management skills. Unless you happen to be the boss, you must use soft power to convince the powers that be that the investment in more privacy is worth it. All in all, there’s a lot that you can do to take charge of your environment. These elements all add up and can make a profound difference to your daily peace of mind as a professional. 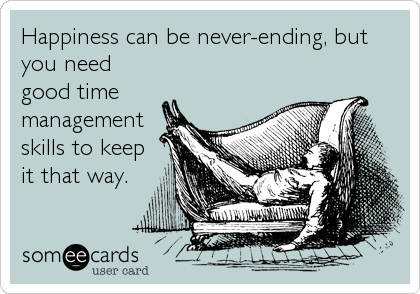 The article I write that was just published on Stepcase Lifehack talked about a connection I picked up in the research between happiness and time management – it’s beyond just a mere time management tip. Building on that article, I recently made an interactive video that includes a self-assessment based on the idea of flow / productive happiness by Mihaly Csikszentmihalyi. You can find the video here in this example of the time management training that’s being done in my online program, MyTimeDesign. One a slightly different note, I recently posted a video on the challenge that consultants have in helping their clients get better at time management. There’s a good reason that tips, tricks and shortcuts don’t work… and we all need to pay attention to this at a time of year when we are simply inundated with trivial lists on the topic. Recently, I watched a couple of videos that gave life to some ideas I have been mulling: that the flow state has everything to do with time management. The flow state is defined by Mihaly Csikszentmihalyi as one of high performance that gives an individual an experience that he says is “optimal.” In this state the individual loses track of time as they devote their complete attention to the task at hand. The task itself is an important one that isn’t easy to complete, and requires their full concentration. Ever since learning about the book, Flow, and its ideas, I have been guided by them. A few years later, they were incorporated into my own time management programs. Then, a few weeks ago I stumbled across a TED video by Matthew Killingsworth that linked happiness to the kind of unhappiness that comes from mind-wandering. His article reinforced my thought that good time management can help prevent unhappiness, and promote productivity/happiness. Rather than just write about it here on the blog, I decided to put together an interactive video that describes this potentially new development. It has a self-assessment built into it, and even a one-step challenge game, and I wrapped it inside the launch of the new MyTimeDesign Plus+ training to make some broader points. Here’s an interesting interview with Richard Branson on how he manages his time, and his 300-400 email messages. I’m a great fan of his practical methods, which are right in line with best practices. What’s interesting is that he has obviously thought about the topic for some time. I’d love to make it to Necker Island — read the article and find out why. Click here to read Richard Branson on Time Management. For some strange reason, the world is conspiring to keep us in a constant state of digital distraction. It affects our productivity, and ruins our peace of mind… while robbing us of that great feeling that comes from knowing we had a great day, in which we got a lot of good stuff done. Solve the problem with the latest ideas in time management that get all the way down to the ways in which you manage your smartphone, tablets and other gadgets. Here’s a great article from Popsop.com that speaks to the follies of multi-tasking, even when we believe we are quite good at it. The fact is, we aren’t, and it actually is a habit that hinders our productivity rather than helps it. Here is a link to the article: The New Multi-Tasking. I found another of Cal Newport’s gems that fits quite well into the 2Time way of thinking. Getting Creative Things Done: How to Fit Hard Thinking into a Busy Schedule. In this post he makes the point that the best way to get quality, creative work done is to set aside dedicated time in one’s schedule, which is the equivalent of 2Time’s Orange Belt level of skill in Scheduling. The only difference of opinion I have with this excellent article is that it’s not only about hard, creative work that academics do. Business professionals at all levels aren’t simply paid to do something without thinking. Instead, managers hope that they are also working on their job, not just in their job… improving it, streamlining it, cutting costs, etc. This kind of continuous improvement comes from using the kind of techniques he describes, which means that this skill has much wider implications on professional productivity than he indicates. This is an interesting essay from Paul Graham that describes two very different mindsets to how one’s time is used throughout the day. He distinguishes between managers who move from one activity to another from creators/makers who need to have large amounts of time to innovate. Managers think in terms of hours, while creators think in terms of half days. It’s an interesting concept, but I don’t believe it’s as cut and dry as he suggests. Instead, I’d say that ineffective managers don’t create anything, and run around from one fire to another. Those who are effective set time aside to creatively make things better, and they do it routinely. They prevent problems from happening by virtue of the advanced problem-solving that they do, and are known for doing the kind of long-range planning that’s the cornerstone of good management. Nevertheless, the way in which managers and makers think is different (even if it shouldn’t be) and he does a good job of separating the two. Maker’s Schedule, Manager’s Schedule – click here to read the article. The author makes a significant change in his time management system, by adopting the practice of working only in 30 minute increments. At the end of the day, he finds himself in the flow state for extended periods of time, which is a must for professionals who do knowledge work. On the other hand, he has a hard time implementing the practice, as it flies in the face of many of his established and unconscious habits. This echoes what I have found in my research, and say in my classes. The skill of Scheduling is critical to entering into the flow state in today’s working world. There are simply too many distractions to contend with, and it takes time and advanced planning to have all the items necessary in order to start. Here’s the link once again: A Day Without Distraction: Lessons Learned from 12 Hours of Forced Focus. A new study was just released that backs up the work done by Mihaly Csikszentmihaly in his book “Flow”, that uses a great deal of neuroscience to back up his notion that we are at our most productive when we are focused on a single tack. If you have to multitask, combine active thinking with automatic, embedded routine or transactional routines. That’s why I can iron a shirt or empty the dishwasher during a conference call and still perform relatively well; or, another manager can sign contracts while she’s thinking about her next sales meeting. Become aware of your mental energy needs and schedule accordingly. Framework Consulting Inc. is headquartered in Hollywood, Florida, USA and is responsible for all the ideas, materials and content on the 2Time and MyTimeDesign websites. See the Contact Us tab to communicate with the company. The 7 Habits of Highly Effective People® is a registered tradework of FranklinCovey. GTD and Getting Things Done are registered trademarks of the David Allen Company (davidco.com.) 2Time is not affiliated with or endorsed by the David Allen Company, Mission Control Productivity or FranklinCovey.